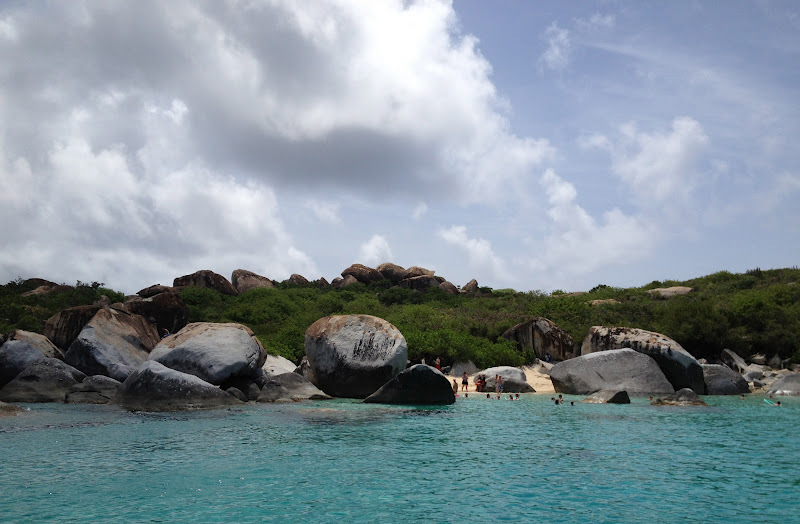 A must see if you are ever in this part of the world is The Baths at Virgin Gorda. Thanks to Stephanie from Odyssey I put this lovely place on my list of places to visit and this week I was lucky enough to go again with my dear husband. These boulders are incredible. Not only are they evidence of the island's volcanic origins but they also have created beautiful grottos that you can explore. We took a boat from St. John and after clearing customs in Spanish Town ( you need your passport! ), our captain dropped us off in the water and we swam our way in to The Baths. It is not a hard swim but I do recommend hanging on to a "noodle" if your boat has one, especially if you are not a strong swimmer. Since we had to swim in and I only had my iphone, I don't have pics of the interior of the caves, but trust me, it's pretty amazing (click here for a peek). However if you don't like crawling through small places, this might not be as fun for you. It is believed that the pirates/explorers would get a little too tipsy and start to imagine that these boulders where whales. Sadly, it is said that The Baths gets it's name from the when the slaves would come and bathe in these caves after working in the Rum Trading. The sand in the caves is/was thought to have healing qualities. It was so nice to revisit this gorgeous and remarkable place. Although, you don't need your passport to visit St. John and the other US Virgin Islands, I highly recommend bringing your passport along so you can explore the nearby islands because they are so close! Which island would you like to swim towards? Oooh, I want to go, too! I spent a summer working and playing on Tobago. Loved it! This place looks fabulous. Such an interesting history. These rocks remind me a bit of Horseshoe Bay in Bermuda. I would love to go back and see these. They are incredible! That's great you were able see The Baths again. We used to pop over from Tortola during off season (which is the best time to go to The Baths, in my opinion), thereby avoiding the winter crowds and strong north swell.